136 pages | 9 B/W Illus. Design clear, reader-friendly rubrics and scoring guides. Each chapter includes ready-to-use tools, examples across the subject areas, and "Think About It" questions to help you reflect on what you’ve read. Many of the tools are also offered as free eResources at www.routledge.com/9781138936140, so you can easily print and distribute them for classroom use. "This excellent book is sure to provide guidance to PLC groups wanting to focus on improved use and understanding of assessment as it relates to raising the level of rigor. Blackburn offers practical ideas that all principals need to firm up their basic knowledge of assessment, and to lead successful discussions with their staff. The book also equips teachers with a good foundation of assessment, reminding them of what rigor is and what rigor isn’t." "Since the term ‘rigor’ is an integral part of the teaching and learning fabric, this book’s concrete explanation of what rigor in assessment actually means will benefit all teachers, school leaders and district leaders." 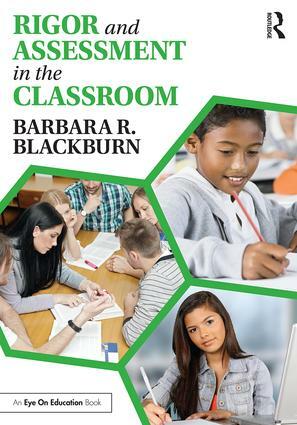 "Barbara Blackburn consistently drives home the need for increased rigor in our schools. In her latest book on rigor and assessment, she gives practical advice and strategies to which teachers understand and relate. I am thankful for her work on rigor and the difference it is made in my district. Thank you, Barbara." Dr. Barbara R. Blackburn is the bestselling author of sixteen books and is a sought-after consultant (www.barbarablackburnonline.com). She was an award-winning professor at Winthrop University and has taught students of all ages.